Annual ryegrass (Lolium perenne ssp. multiflorum L.) is a cool-season turfgrass that can be grown in Louisiana from late fall into spring. Though temporary, overseeding lawns with annual ryegrass can provide cover and green color when existing warm-season turfgrasses go dormant. It can grow in a wide range of soils and has an extensive root system. Annual ryegrass has a lighter green color and grows taller when compared to perennial ryegrass. Seeds can be planted in midfall and generally establish within four to six weeks. 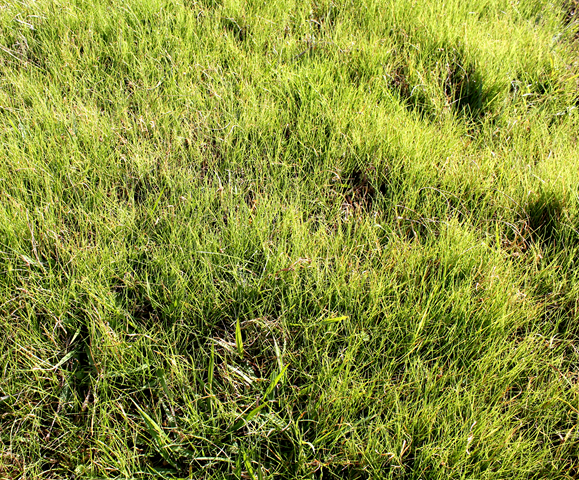 Annual ryegrass is a moderate-to-coarse-textured turfgrass. Leaves are glossy and light green and come to a sharply pointed tip. Seed heads are composed of a single flower stalk with small white-to-brown flowers attached alternately on the stalk. Annual ryegrass produces no stolons (aboveground stems) or rhizomes (underground stems), only tillers from the base of the plant. Annual ryegrass can be established quickly from seed. Soil Type: Grows in a range of soil types and can tolerate some soil compaction. Soil pH: Prefers soil with a pH of 6 to 8. If soil is too acidic (< pH 7), ryegrass will decline. Always follow soil test recommendations to achieve desired soil pH. Light: Prefers full-sun areas. Has poor shade tolerance compared to other cool-season turfgrasses. Mowing & Traffic: Mow at 1 to 3 inches routinely during the growing season. Never remove more than one-third of the leaf blade height at one mowing. Mowing at the appropriate height is key in preventing scalping and reducing weed encroachment. Annual ryegrass has moderate to poor traffic tolerance. Dethatching and Aeration: Because annual ryegrass is not a perennial turfgrass, thatch formation should not be an issue. Compaction can form more quickly on finer texture soils and in areas where there is high traffic. Compaction can limit seed germination and emergence. Aeration can be performed prior to seeding but aeration should be performed when the warm-season turfgrass is actively growing. Establishment of annual ryegrass for temporary cover or overseeding of a warm-season perennial lawn can be achieved through seeding. Seed: Select and purchase your desired seed and follow the manufacturer’s labeled directions for the seeding rate per area. Rake seeds into a smooth soil surface and keep watered until germination and throughout establishment. If annual ryegrass seed is being used for overseeding a perennial warm-season turfgrass, use a seeding rate of 5 pounds pure live seed (PLS) per 1,000 square feet. Be sure to work seed into the existing turfgrass canopy for greater seed establishment.